Gallipolis City Commission holds its regular meetings the first Tuesday of the month at 6 p.m. at 333 Third Avenue in the Gallipolis Municipal Building. The meeting room can be accessed from 2 1/2 Alley. 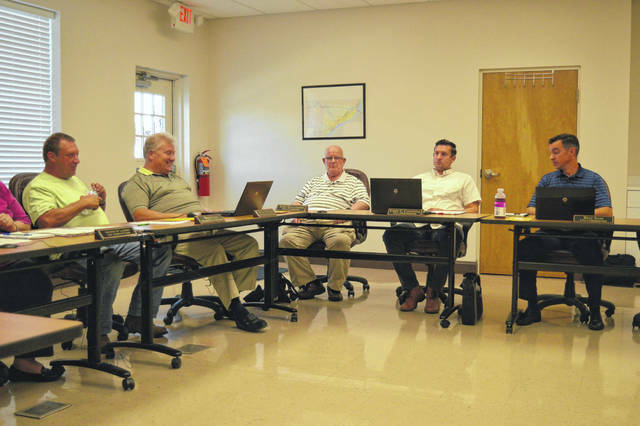 GALLIPOLIS — Gallipolis City Commission gathered for its regular meeting Tuesday night and continued conversation with concerns of aging infrastructure and ongoing maintenance. A member of the audience asked Greene how many miles the city maintained. Commissioner Beau Sang mentioned it was possible to not have to do the project all at once. Greene answered that was true but oftentimes lines were laid “on top of the other.” Greene did agree that the city would not have to replace all the line mileage at a time, however. Gallipolis is looking to start working on a waterline to the Gallipolis Developmental Center soon. The Gallipolis Water Treatment Plant is looking to set up a new generator. Gallipolis previously applied for a paving grant last fall and the Ohio Public Works Commission recently approved financial assistance for the project. The city is looking to receive $187, 227. It requires a $47,000 match from the city. Greene said he and the City Auditor and Clerk Annette Landers ideally wanted to engage in the paving project in the spring of next year, but OPWC said grant funding needed spent by the end of the year so the city would need to move on soon with paving. The city is still looking to replace a culvert on Airport Road and make repairs to the Gallipolis City Park Bandstand and Kerr Memorial Fountain with calls going out to professionals.